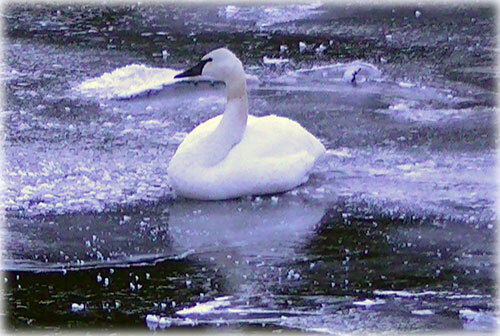 Ward Cove: Trumpeter Swan -- The Trumpeter Swan (Cygnus Buccinator) is one of the most beautiful of water birds. Their thick layers of down make it possible for them to tolerate harsh winter days making it possible for them to tolerate harsh winter temperatures as low as -22 F.
Ketchikan: Ketchikan Indian Community Election Results - Ketchikan Indian Community members concluded their 2012 Tribal Council and Advisory Health Board election Monday January 16th at 8:00 pm. Ballots were counted until 1:00am. Canvassing and certification took place Tuesday morning and finished shortly before 2:00 pm. Re-elected to the Tribal Council for another two year term were Donna Frank and Rob Sanderson. New members to the council are Delores Churchill and write-in candidate Andre Lecornu. Lecornu, as a write-in candidate, receivef the most votes with 184 followed by Donna Frank at 172 votes and Rob Sanderson came in with 162 votes. Delores Churchill rounded out the vote totals with 125. All of the candidates elected last night will serve two-year terms. Southeast Alaska: SEA PARTY DELIVERS 33,500 SIGNATURES; Grassroots Group Exceeds Goal In Effort To Restore Coastal Management - The Alaska Sea Party today delivered to the Alaska Division of Elections more than 33,500 signatures endorsing a statewide ballot initiative to restore Alaska’s coastal management program. Last month, the grassroots group set out to gather 26,000 signatures by the start of the legislative session in order to place the initiative on the 2012 election ballot – an unprecedented effort in the history of citizen activism in Alaska. Sea Party officials will now watch to see if the Alaska State Legislaturepasses a substantially similar law. If that happens, the initiative will prove unnecessary. But if the signatures are verified and the legislature fails to act, the initiative will appear on the August primary election ballot. Alaska: Alaska Airlines Cancels 38 Flights - In response to heavy snow forecasted in Seattle and Portland, Ore., on Wednesday, Jan. 18, Alaska Airlines is proactively canceling 38 flights scheduled to depart beginning at 6 a.m. PST. Customers traveling on flights into and out of Seattle and Portland tomorrow are urged to check www.alaskaair.com before leaving for the airport. Alaska: Begich Asks NOAA for Update on Marine Debris Plans - U.S. Sen. Mark Begich today sent a letter to National Oceanic and Atmospheric Administrator (NOAA) Dr. Jane Lubchenco asking for some answers regarding plans to deal with the debris that is expected to hit the shores of western states, including Alaska, from the devastating tsunami which hit northern Japan last year. Alaska: Alaska Exports Top $5 Billion for First Time - Governor Sean Parnell announced today that Alaska has topped the $5 billion mark in exports for the first time. The news reflects goods exported from January through November 2011, according to the U.S. Census Bureau. Alaska’s total exports were $4.2 billion for all of 2010. Alaska: Chimney Fires Increase During Cold Weather - The recent bitter cold has sparked an increase in chimney fires in several Alaskan communities. If not detected early these chimney fires can expand into a devastating structure fire. As temperatures drop, many Alaskans rely on their fireplace and woodstoves to keep them warm. Special care and maintenance is required to protect your home when heating with woodstoves and fireplaces. Southeast Alaska: EPIC SOUTHEAST ALASKA SHOREZONE COASTAL MAPPING PROJECT COMPLETED - People around the world can now get an eagle's-eye view of all of Southeast Alaska's shoreline without leaving home, now that the award-winning ShoreZone project has been completed for the entire coastline from Dixon Entrance to Yakutat. 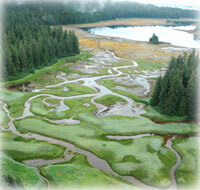 Salt marshes in Southeast Alaska. NOAA and other members of the ShoreZone Partnership will make a presentation on the recently completed seven-year project January 19 at the 2012 Alaska Marine Science Symposium in Anchorage. About 30,000 kilometers (19,000 miles) of coastal habitat was mapped during the project—a milestone equivalent to surveying the entire Pacific coastline of Washington, Oregon, and California, twice. The habitat mapping effort followed ShoreZone protocols that have been applied throughout British Columbia, Washington, Oregon and the remainder of the Gulf of Alaska. The 30,000 km of Southeast Alaska data has been added to the larger statewide ShoreZone dataset. The project also marks the first time Southeast Alaska's entire coast has been mapped at the lowest tides of each year. "One of the amazing aspects of this project is that the entire shoreline is imaged at low tide, which took a lot of planning," said Dr. John Harper, project manager for Coastal & Ocean Resources, a partner and the primary contractor for the project. "Only some of the images on Google Earth have been collected at low tide. So this is the first time we are able to see the entire intertidal zone." RE: AMHS FERRY By Don Husler - I also think the Alaska Ferry System is making a huge mistake. If we are going to build day boat then we should be building day boats. Similar to the Aurora, Keep it under 1600 tons. We are never going to get rid of a mainline ferry. But a 350' ferry is not our answer. - More..